ASUS will soon launch their newest smartphone in the Philippines, the ZenFone Max Pro M2. 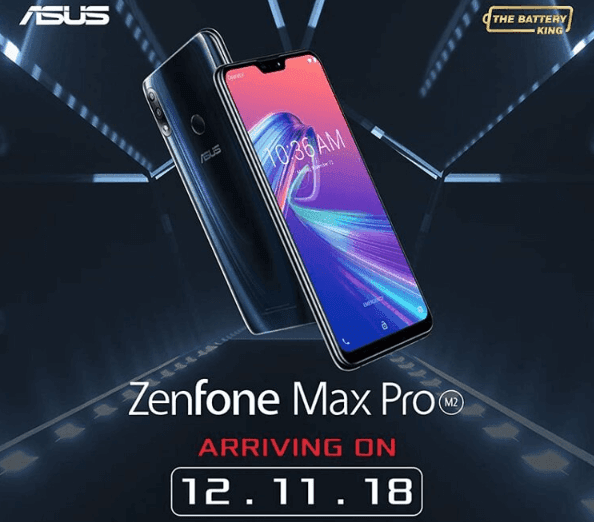 ASUS Philippines announced that they will officially unveil the ZenFone Max Pro M2 on December 11, 2018. The handset is the highly anticipated follow-up to the Max Pro M1. Based on the teaser photo, the handset is accompanied by its #ReimagineTheMax tagline, suggesting that just like its predecessor, the ZenFone Max Pro M2 will be a battery-centric smartphone that can last longer compared with other devices. The handset comes with a sleek looking 3D glass design. The ZenFone Max Pro M2 flashes a big screen with a notch on top of it. The image also confirmed that it will only have 2 cameras instead of the rumored triple-lens setup. The third slot in its vertically aligned setup is for the flash. The teaser poster of ASUS also showed that it will have a fingerprint scannera the back above the ASUS logo. The handset touted for “non-stop” and still be dubbed as the battery king. The device is said to feature a 6.3-inch FHD+ screen with Corning Gorilla Glass 6 construction on the top. Under the hood, the handset is said to carry a Snapdragon 660 chipset paired with Adreno 512 graphics. It might be coupled with 4GB of RAM and 64GB of internal storage, too, which could be expanded up to 2TB via microSD card. ASUS didn’t reveal much about its specs and features, but according to rumors, it will be a capable mid-ranger. It will also have a big 5,000mAh battery, 12MP Sony IMX486 + 5MP depth camera at the back, and a 13MP selfie snapper. The handset is also expected to boot with stock Android Oreo OS out of the box. It is also said to have WiFi 802.11/b/g/n, 4G LTE, Bluetooth, GPS, A-GPS, GLONASS, BDS, OTG, NFC, and dual SIM slots. It will come with a triple card slot for microSD and dual 4G SIM slots. The handset measures at 157.9 x 75.5 x 8.5 mm. As a Battery King smartphone, the Max Pro M2 could be powered by a whopping 5000mAh stamina. It will be available in midnight blue and cosmic titanium color options.There are no details about its price yet. Stay tuned for more updates.